Recently I went to visit with my buddy, Susan, and her household’s two dogs, Bruce and Bain. You’ll hear Bain’s comments at various times during the show, just the way you occasionally hear some of the audio from things in my house like the train that runs just behind our yard. I’m partial to including a little locally occurring audio ,because it adds another sense to the personal journal style of the show. Don’t you feel like you know Susan by now? I’m always mentioning her and the time we’ve spent together in this show. This month I got a chance to share a sewing day at Susan’s house with you. It started out as an interview, but it became a duologue – even when I cut out several of the places where I interrupted! Pensamientos Primeros/First Thoughts . . . we talked about our sewing relationship and some of the non-sewing things that give you a sense of who Susan is and what drew us together. Entonces/Then . . . we talked about some of the things that she learned about fitting patterns, that I’ve benefitted from over the past couple years. This month's Pensamientos Finales/Final Thoughts . . . are scattered throughout the show as we each share with you a little something about where Susan is living. The area she’s recently moved to has a very long-term historic role in agriculture and pre-agriculture, within California, that has provided people with both food, fabric, and more, for over 4,000 years. Ench By Sew-027: Festive Holiday Tees and Tes - Our best holiday episode ever! Socializing at this time of year, sharing a cup of tea and a light meal, admiring something a friend has made, engaging together with a sewing project, and getting advice on it, that’s the kind of thing that keeps me . . . enchanted by sewing. Our best holiday episode ever! My blog is written in English. The name celebrates the historical and modern use of the beautiful Spanish Language in the San Francisco Bay Area of California, where I live. This show is created, produced and brought to you by Laurel Shimer. 2. A plain Red version - still a little work to do finishing up the neckband. Perfect for Christmas and Valentines day, but it will see plenty of other use. * Ivy –A new shirtdress from my tried-and-true M3623 pattern, Inspired by Mrs. Obama! *Come on over for holiday tea and sewing* In the show, I share lighter holiday offerings, inspired by three sewing and tea parties I've gone to or been hostess at recently. I wish you could have come too! I substitute white whole wheat flour for the all-purpose. Love the texture of the almond meal and the flavors of the orange zest and blueberry. Made them twice in short order. Very popular with my family. d. Persimmon oatmeal cookies - I didn't have the psyllium husks and substituted some applesauce for the persimmon when I ran short. They were great anyway! I have the The Unofficial Harry Potter Cookbook this Bath Bun recipe came from (someone else has typed up on this page) and I made these buns for supper one night, along with a nice meaty beef stew. I used golden raisins. Many recipes in the book are heavy on the butter, but this much less so. Delicious, very holiday tasting with the caraway seeds. Food processor - Take out all pits! - Store in your cutest tin! Ench By Sew-026: Embellishment Via Vancouver B.C. This show is EMBELLISHMENT VIA VANCOUVER B.C. Recently I visited western Canada - Vancouver BC - for a six days trip. My husband attended a conference for GSA. Not being a geologist, I went along for fun! I’ve taken four trips to Vancouver in the last six years. It's a place we really love to go. We are all really drawn to the city and the vicinity. We identify with the city as fellow westerners. There is a strong bond of shared history and culture, between people in the western Americas, particularly down along the coast. There's also a lot of ross culture with my home in the San Francisco Bay area. That said, there is a spice of difference and Canadian feeling. We feel both comfortable, and excited with the sights sounds and smells(!). In the show I discuss . . .
the out of doors, and local city life affected my sewing ideas and the shape of my travel style. Button Button is on the edge of Gas Town. It's where the Steam Clock is. Yup, it was being renovated when I was there! Located in the Net Loft Beadworks is the ultimate destination for all of your jewellery making needs. Choose from thousands of different beads; from pearls to shells to glass and everything in between, and materials for making earrings, bracelets, necklaces, and more. Ask the helpful staff for tips, and you can even create your one-of-a-kind accessories in-store. We also offer classes. Stanley Park is a huge fantastic city park. Wonderful views of the water, water activities, biking, walking. Woods too - take your pick. This month’s show is “ Restylin’. It all came about when I started shaking the dreams from my hair. Restylin' is about my transition in sewing and wardrobe style . It involves looking at patterns, and working my brain around how it makes sense for clothes to fit me. Reworking my sewing style/methods. Pattern alteration experiences. Restyling has me shaking the dreams from my hair. That’s just one more thing that keeps me . . . This month I sewed two dresses – a shirtdress for me and a fitted sleeveless bodice full shirt for my daughter. There was a lot going on emotion ‘wise for our family this month and I sewed those dresses for a siginificant family event. Creating something tangible was a way to work through those emotions. Sewing up fall – whether it’s imaginary experience or creating something tangible – is one of the things that keeps me Enchanted by Sewing. created, produced and brought to you by me! - Laurel Shimer. I’ve worked on a couple of different sewing projects in August. Of the four I’ve worked on I’ve finished three - a wardrobe building elastic waist black denim skirt (like the blue one I finished in June and have been wearing so much), another semi-fitted sleeveless cotton blouse (like Amaryllis the subject of last months 'cast - I haven't post about this yet, but plan to soon) and a tapestry cap. That cap is especially important to me. As you might have noticed in previous shows I am kind of a preacher when it comes to protecting our skin from the elements. I listened back to my shows from the last couple of months, and it seemed like I went into great detail in both ones about wearing my sun screen and a cap whenever I head out the door, whether for a walk or even a ride in the car. I figured if it was so important to me, it was time to do an episode about the kind of skin protecting garment I’ve made a few times now, sharing the techniques and some of my inspiration. Why do I need to make my own caps and hats? How I create caps, based on the "Good Hat Day Hat (cap)" in the first One Yard Wonders Book. 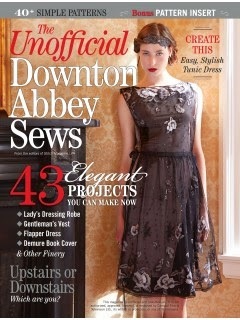 There's a pretty cloche-esque hat pattern in this magazine, which has a lot of other fun stuff as well. In my slow sewing July, I focused on sewing just one pink and white striped seersucker sleeveless blouse. Like my CA Summer skies shirt– (that was blue and white checked seersucker shirt ) I sewed and talked about last months show, my new sleeveless blouse, who I call Amaryllis (in honor of the musical, "The Music Man"), has quickly become an important staple of my summer wardrobe. And sewing a few more blouses, as a result of what I thought and learned about sewing this most recent garment, is something I’m considering when it comes to more summer sewing. Slow Summer Sewing – Budgeting my sewing time and energy and coming out on top by improving sewing skills. Increasing my wardrobe choices. It’s about Feeling satisfied with my sewing recreation time and output. The show notes (http://EnchantedBySewing.blogspot.com) include links to the slow living movement, including the slow stitching movement. i) What’s a shirt what’s a blouse? Sometimes I’m able to take an actual summer vacation and other years I focus on treating the summer like a vacation, even when I don’t leave the San Francisco Bay Area, where I live. This summer I was able to take a mini vacation weekend trip to Disneyland this year. As a matter of fact I just got back☺ I went with my beautiful, kind and funny , young adult daughter. Getting to bond her at this age is really fun! I took along a newly finished garment from my summer wardrobe on the trip and I’ll talk more about sewing that in the show. I’m going to continue to focus on treating the rest of the summer like a vacation, no matter what I get to do. And I’m going to continue to sew for my summer vacation, no matter how far afield of home I manage to go. For some people, sewing is just practical . For another segment of society, and I’m one of them, sewing is an important creative outlet that helps us to stay healthy and happy. A bustier is an alluring garment, one many women would like to wear - if they dare. When I began to notice that women of all shapes, sizes and ages sewed and wore their bustiers with pleasure and pride, I decided to take a chance and learn to sew this very structured garment, that can be designed to flatter a wide variety of figure types.